Providence Homes: 2012 Judges Choice for "Pick of Parade"
Congratulations to the Providence Homes team! 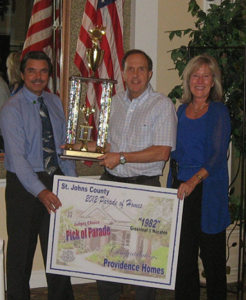 Providence Homes was recently recognized by the St Johns County Builder Council for winning the “Pick of the Parade” at the 2012 Parade of Homes Banquet. This award recognized Providence Homes “1982” Model Home at Greenleaf Village in Nocatee as the “Pick of the Parade” for its overall design, interior appointments and value. Providence Homes also received best in class awards for three (3) other model homes, the 2287 Model Home in Nocatee, the Normandy Model at Durbin Crossing North & the 3110 Model Home Aberdeen. The 2012 St Johns County Parade of Homes is from 1-16 September 2012.